A helicopter heads to pick up a bucket of water to fight a wildfire on Moccasin Mesa on Saturday. A helicopter with a bucket of water heads back to the wildfire on Moccasin Mesa on Saturday. 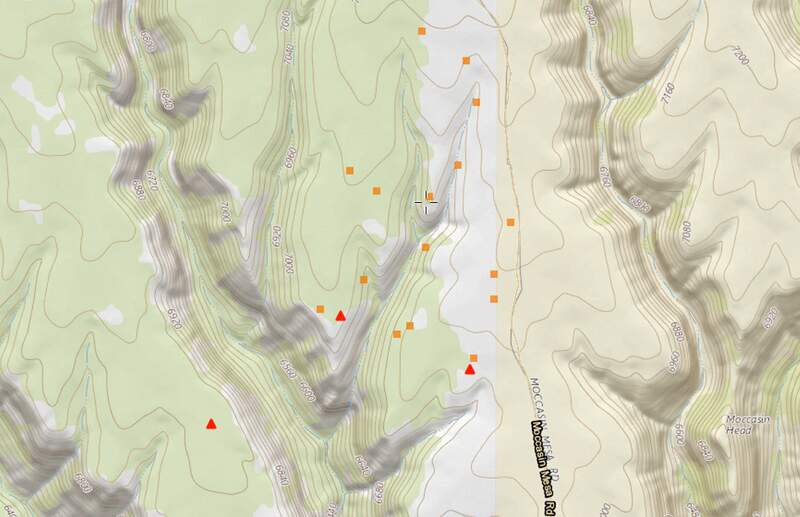 Courtesy photoA satellite heat map shows hot spots in the Moccasin Mesa Fire in Mesa Verde National Park. Most of the hot spots are located within the park boundary, with scattered hot spots on Ute Mountain Ute land. 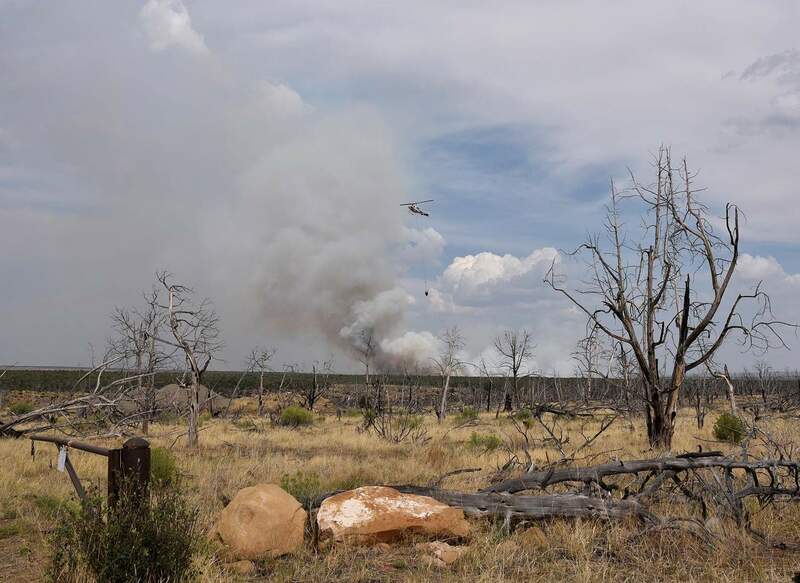 The Moccasin Mesa Fire, burning near the far southeast boundary of Mesa Verde National Park, remained at 185 acres on Monday, according to a park press release. 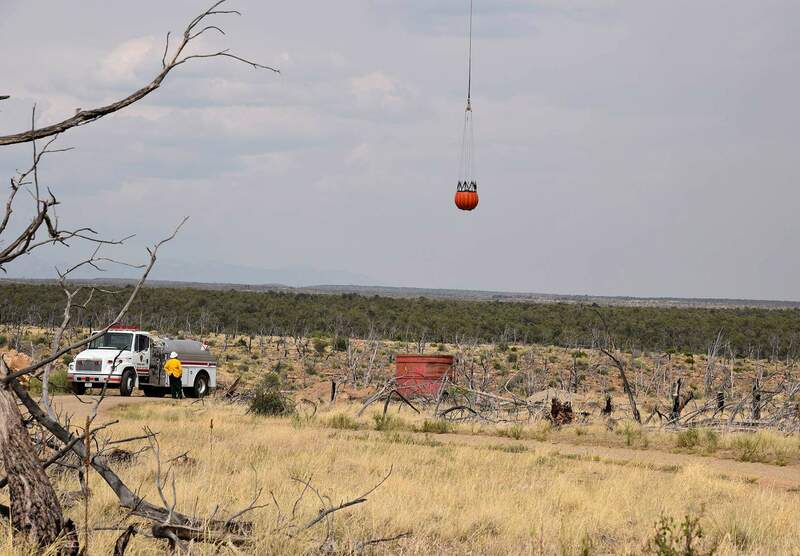 A map based on satellite data from the U.S. Forest Service and NASA showed hot spots on Mesa Verde and Ute Mountain Ute land. The fire’s point of origin has not been disclosed. The Moccasin Mesa Fire was reported by Park Point Lookout about noon Saturday, said park public information officer Cristy Brown. On Monday, it was 5 percent contained, Brown said. A Type 3 incident command team, from Durango, assumed command of the fire on Sunday. According to Brown, about 80 personnel were working on the fire on Monday, including “resources” from the Bureau of Indian Affairs, National Park Service and U.S. Forest Service. Equipment includes a Type 2 and a Type 3 helicopter, single-engine air tankers and engines from Fremont County and Pike National Forest. Their objectives on Monday included building containment line and maintaining a strategy of full fire suppression, with a direct attack. Previously burned areas on Moccasin Mesa, including the Balcony House Complex (2003) and Moccasin Mesa Fire (1972) have aided in slowing the progress of the fire, Brown said. The park is open, and services on Chapin Mesa are available; however, the Chapin Mesa Picnic Area, the large parking lot near Park Point (B Cut Parking Lot) and areas of the Visitor and Resource Center parking lot have been closed and will be used for firefighting operations. The park reminded visitors that fire personnel have the right of way and asked that visitors do not stop in the roadway. Drones are prohibited in the park. On Saturday, the park announced on its Facebook page that the fire was “in the park on Moccasin Mesa” and was at 75 acres. A post stated that two canyons separated the fire from the main park road and park headquarters, the museum, Cliff Palace and Balcony House, without providing the fire’s precise location. Brown reported that the fire grew to 185 acres by Sunday morning. Moccasin Mesa Road runs north-south through the park and continues north-south just east of the park’s most southern boundary in Ute Mountain Ute tribal land. A Durango Herald article in 2017 described the fragile nature of the park’s vegetation. From 2000 to 2003, a series of wildfires ripped through Mesa Verde National Park, burning about 24,000 acres – nearly half the park’s old growth forest. Now, almost two decades later, park managers and biologists are concerned that the piñon-juniper woodland is showing virtually no signs of growing back. A severe drought in the 1990s caused perfect fire conditions – dead, dry trees – so when a lightning strike hit private property near the entrance of Mesa Verde at about 1:30 p.m. July 20, 2000, it wasn’t long before a fire spread, ultimately consuming 19,607 acres within the park.